French toast has taken on many a form around these pages, from muffins to sticks and nearly every cheesecake-stuffed, whipped cream-topped, fruit-filled variation in between. 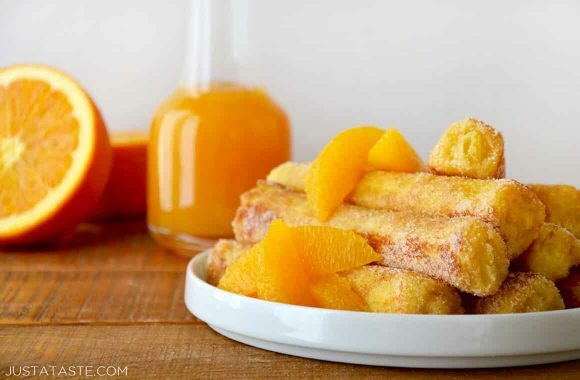 And now this beloved breakfast classic is ready for its biggest makeover yet: French Toast Roll-Ups with Orange Syrup. We’re combing all of French toast’s greatest hits into one quick-fix recipe, and I’ve made orange juice the star of the show. I’m thrilled to be continuing my partnership with not-from-concentrate Florida’s Natural® Orange Juice as a member of their Brunch Club. You may remember last year’s creations (hello, Baked Orange Chicken Tenders and Orange Baked French Toast! ), and my love of all things Florida since my husband is a born and raised Floridian. Needless to say, I’ve got deep ties to the Sunshine State! Every year we head to south Florida to visit my husband’s family and I have amazing memories of driving up and down the coastline watching the orange groves whiz past us. But the only thing better than the aroma of fresh citrus in the Florida air is the taste of it. A few quick glances around these pages and it won’t take long to discover that I am a brunch enthusiast. But now that our son is 7 months old, my brunching days have transitioned from leisurely mimosa-filled late mornings to slightly less leisurely (but still mimosa-filled) super early mornings. With sleeping-in a thing of the past, I rely on a cold glass of orange juice to kickstart the day. Even better? 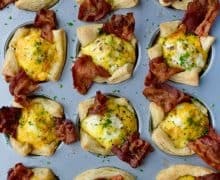 Turning that orange juice into a brunch showstopper! 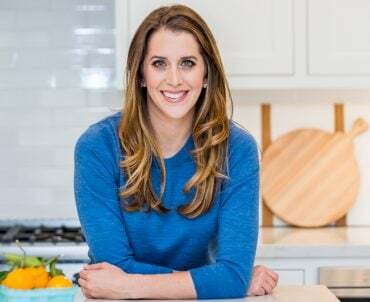 And Florida’s Natural Orange Juice has inspired me to bring those amazing East Coast roadtrip memories into my West Coast kitchen. So how does one transform an ordinary loaf of sandwich bread into a dish worthy of the Florida’s Natural Brunch Club? It all begins with a bit-o-rolling. So lose those crusts then grab the rolling pin and flatten your bread of choice into thin sheets. 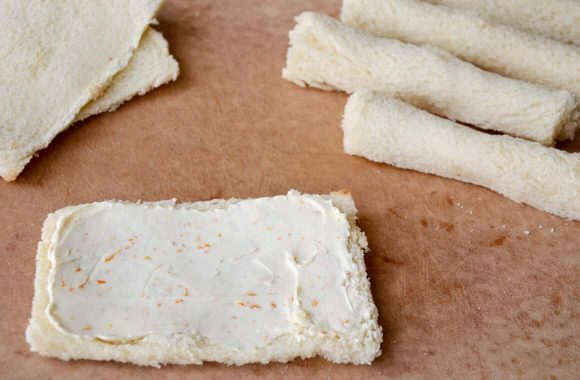 Next up, slather the bread with a layer of tangy cream cheese flavored with fresh orange zest and vanilla extract. 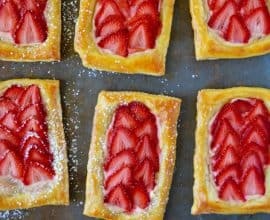 This pseudo-cheesecake filling ensures the rolls stay sealed during the coating and cooking process, and guarantees a touch of fresh citrus flavor in every bite. Dip the rolls into an egg wash then let them sizzle in a hot sauté pan until golden brown. 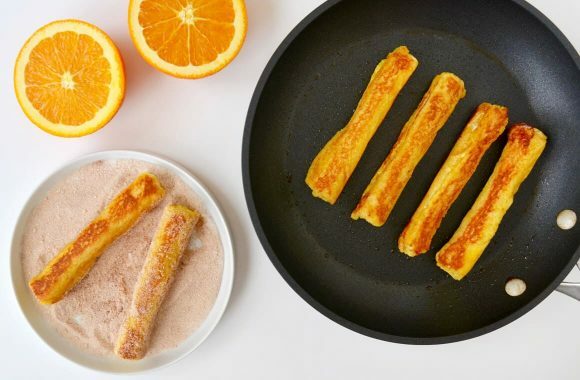 And then these French toast roll-ups borrow a page out of the ol’ churro playbook with a quick shimmy in cinnamon and sugar. We could stop right there and dig in, but why not dress up your breakfast table with a little DIY orange syrup for dipping and dunking? Cue the orange juice! My early A.M. orange juice ritual brightens the morning and helps me get my day going so I can keep up with a little one that’s almost on the run. I ditch the caffeine in favor of a cold glass of Florida’s Natural Orange Juice because it’s made from a single ingredient: oranges! We’re talking 100 percent real Florida oranges, just like the ones I see in the groves every year when we visit my husband’s family. Whisk that juice together with a few simple ingredients and let the flames work their magic to go from juice to luscious syrup in minutes. 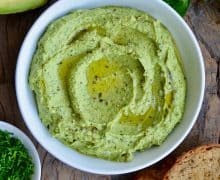 Now it’s up to you to decide: Do you do a dainty dip? A hearty dunk? A silky-smooth pour? No matter how you dish it out, one thing is certain: French toast roll-ups are the ultimate update to a brunch classic. 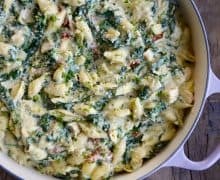 Looking for more inspiration in the kitchen? 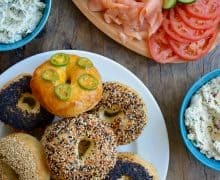 Check out my fellow Brunch Club members’ creations on the Florida’s Natural Pinterest board for Whole Wheat Orange Chocolate Scones, Orange Muffins, Glazed Orange Scones and more citrus-filled favorites. 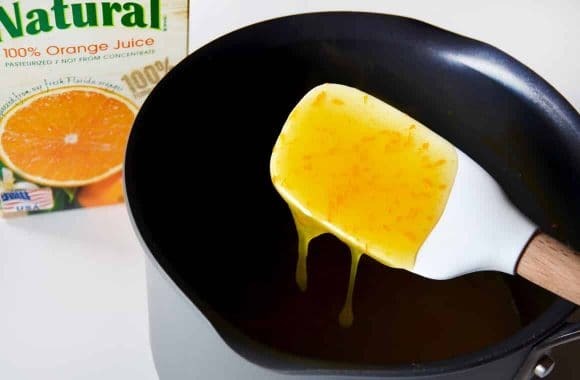 In a medium saucepan, whisk together the orange juice, sugar and cornstarch. Bring the mixture to a boil and cook it, stirring occasionally, until it thickens enough to coat the back of a spoon, about 5 minutes. Remove it from the heat and immediately stir in the orange zest, vanilla extract and butter until the butter is melted. 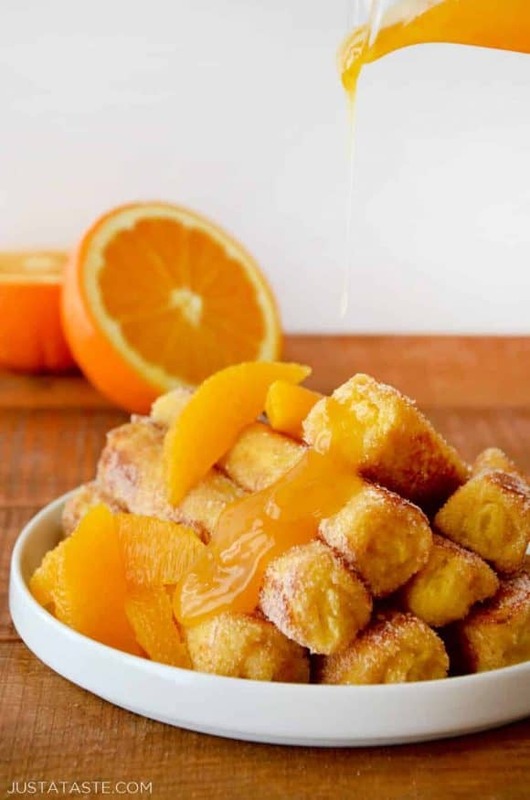 Serve the orange syrup warm atop the French toast roll-ups (recipe follows) or store it in an airtight container in the fridge for up to 1 week. Using a rolling pin, roll each slice of bread until it is flattened. Set the bread aside. 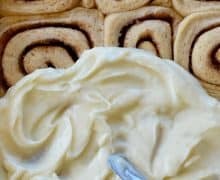 In a medium bowl, combine the cream cheese, orange zest and vanilla extract. Using a handheld mixer or a spatula, beat the mixture until combined. 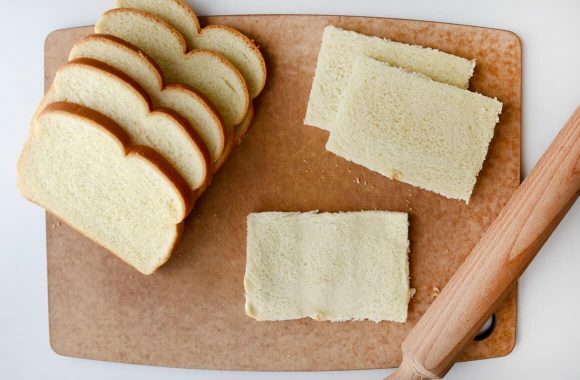 Spread a portion of the mixture atop each slice of bread and tightly roll up the bread slices lengthwise. In a shallow dish, whisk together the eggs and milk. In a separate shallow dish, whisk together the cinnamon and sugar. Heat a large nonstick sauté pan over medium heat. Add the butter and once it has melted, dip each French toast roll-up in the egg-milk mixture then place it in the sauté pan. 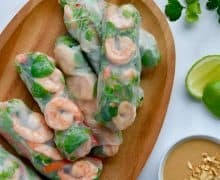 Repeat the dipping and cooking process with the remaining roll-ups, turning them in the pan until all sides are golden brown. Once the roll-ups are cooked, immediately transfer them to the cinnamon-sugar mixture, coating them on all sides. 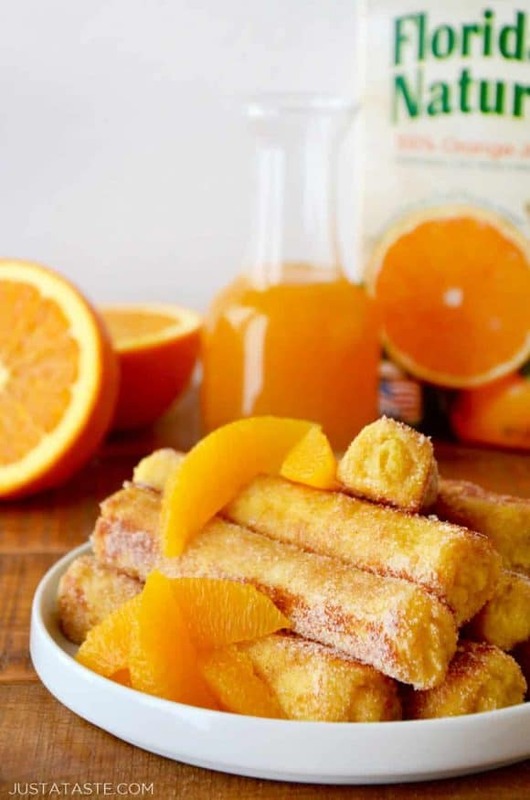 Serve the French toast roll-ups topped with the orange syrup for dipping.